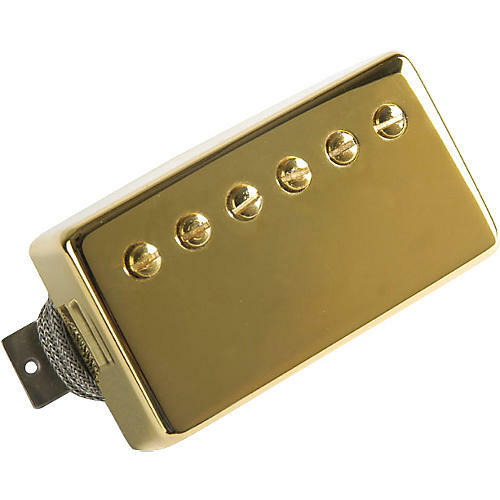 The Burstbucker Type 2 humbucker is wound in the range of Gibson's '57 Classic for replica sound. Unpolished magnets and non-potted coils, just like the original. Slightly hotter than the BurstBucker 1, the 2 works well in the bridge position with a BurstBucker 1 in the neck position. On the shop floor of the original Gibson plant in Kalamazoo, Michigan, the earliest Gibson "Patent Applied For" humbuckers were wound using imprecise machines, resulting in pickups with varying degrees of output and tone. The BurstBucker line of pickups represents Gibson's drive to recapture the magic of the original "Patent Applied For" humbuckers. First introduced in the early 1990s, the Gibson BurstBucker - Types 1, 2, and 3 - successfully captured the subtle variations of true, classic humbucker tone with historically "unmatched" bobbin windings and Alnico II magnets. They produce an airy, full tone, and when overdriven they achieve a magical distortion with the slightly enhanced highs that made the originals famous. BurstBucker Type 1 features a lower output, excellent for the neck position. BurstBucker Type 2 features medium output, and is perfect for both positions. BurstBucker Type 3 is overwound and hot, which is typically ideal for the bridge position. None of the BurstBuckers are wax potted, and all feature vintage braided two-conductor wiring.